HydroFLOW USA of Redmond, WA, received the prestigious Innovative Technology Award from the Water Environment Federation (WEF), an international not-for-profit technical and educational water quality organization. The Innovative Technology Award recognizes WEF Associate Members who have introduced new innovative products or services related to the construction, operation or maintenance of treatment facilities. The HydroFLOW product, powered by Hydropath technology, showed to be extremely innovative with field data supporting the claims of removing struvite build up in pipelines. This product could have an extreme benefit for many plants around the US struggling with this issue in their digesters, connecting pipes and dewatering devices. 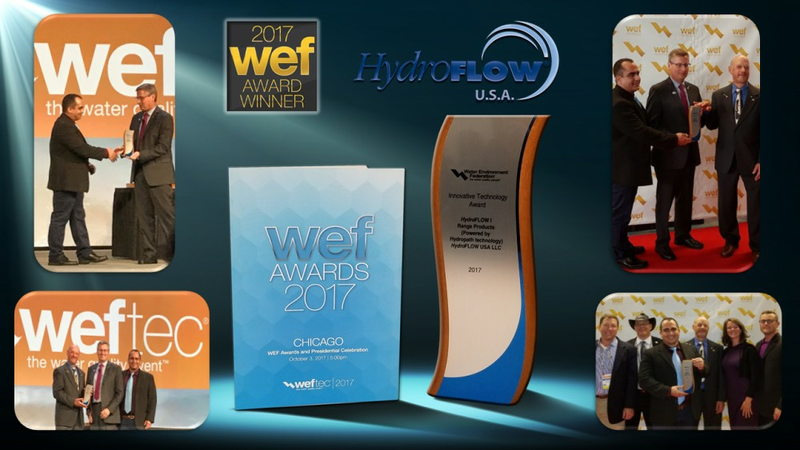 HydroFLOW USA was honored during WEFTEC® 2017, the world’s largest annual water quality conference and exhibition, in Chicago on October 3. To learn more about HydroFLOW USA solutions, contact us today.